Kate Brown is a Professor of Science, Technology and Society at Massachusetts Institute of Technology. She is the author of Manual for Survival: A Chernobyl Guide to the Future (2019), Dispatches from Dystopia (2015), Plutopia (2013), and A Biography of No Place (2004). Brown has received many research grants and written many articles. The Hanford site represents two-thirds of the nation's high-level radioactive waste by volume. Nuclear reactors line the riverbank at the Hanford Site along the Columbia River in January 1960. 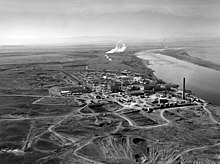 Richland, Washington was the first city established to support plutonium production at the nearby Hanford nuclear site, to power the American nuclear weapons arsenals. Ozersk, Russia supported plutonium production to power the Soviet nuclear arsenals at the Mayak nuclear plant. These were the first two cities in the world to produce plutonium for use in cold war atomic bombs. In the 2013 book on a history of these two cities, Plutopia: Nuclear Families, Atomic Cities, and the Great Soviet and American Plutonium Disasters (Oxford), Kate Brown explores the health of affected citizens in both the United States and Russia, and the "slow-motion disasters" that still threaten the environments where the plants are located. According to Brown, the plants at Hanford and Mayak, over a period of four decades, "both released more than 200 million curies of radioactive isotopes into the surrounding environment -- twice the amount expelled in the Chernobyl disaster in each instance". Brown says that most of this radioactive contamination over the years at Hanford and Mayak were part of normal operations, but unforeseen accidents did occur and plant management kept this secret, as the pollution continued unabated. Even today, as pollution threats to health and the environment persist, the government keeps knowledge about the associated risks from the public. ^ Mark Peplow (27 March 2013). Military history:Dinner at the fission chips. Nature. ^ Rob Edwards (18 March 2013). "The radioactive legacy of the search for plutopia". New Scientist. ^ a b c Robert Lindley (2013). "Kate Brown: Nuclear "Plutopias" the Largest Welfare Program in American History". History News Network. ^ "Kate Brown". John Simon Guggenheim Memorial Foundation. 2018-03-20. Retrieved 2018-03-20. ^ "John H. Dunning Prize Recipients". American Historical Association. Retrieved December 24, 2017. This page was last edited on 11 March 2019, at 10:54 (UTC).